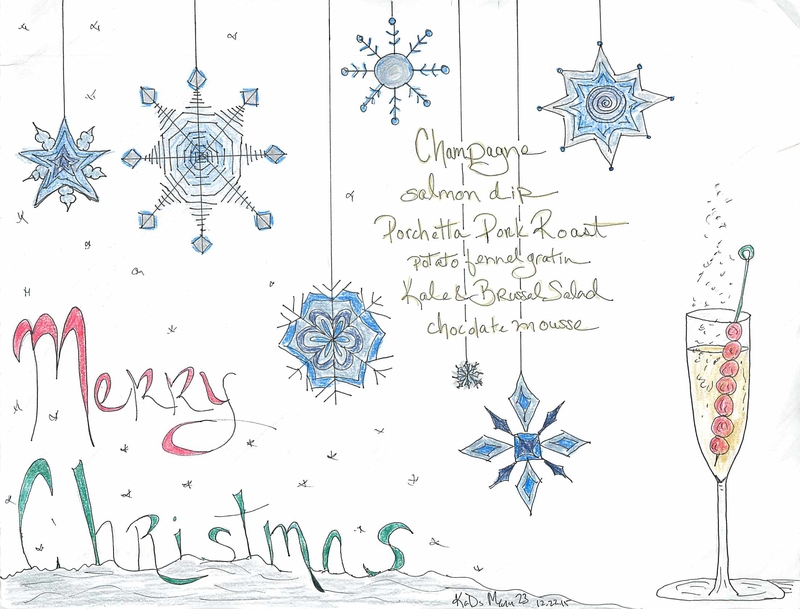 Menu 23 – Merry Christmas! The big day is almost here! 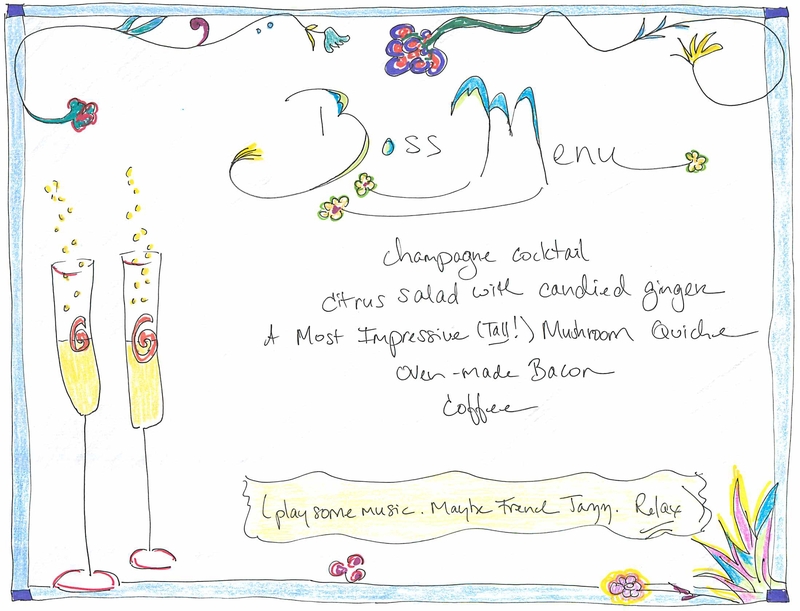 (still totally behind with the shopping; annual cards haven’t gone out…) but don’t panic – the menu is done! I have the best memories of my mother’s Christmas dinner. She was a goose lady, and it was delicious, gamey and not tough. She also went whole Anglo and made English Plum Puddings with hard sauce of butter/sugar/brandy…just what a kid needs. I am doing none of the above. Some things are meant to be memories. This year we are keeping things relatively simple but you know, awesome. We will be enjoying champagne kept cold with frozen cranberry skewers. There will be salmon dip on rye. On Christmas Eve we will prep a pork shoulder with porchetta flavors and roast it Christmas morning (everyone deserves pork fat cracklings on Christmas). The pork requires fennel fronds, so let’s use the rest of the fennel in our potato gratin and bask in potato cream and gruyere glory. Because I live in Brooklyn and fall victim to stereotypes, we are serving a kale salad with crisp lemon dressing – there’s a twist – it has brussel sprout leaves too! And last but not least, chocolate mousse. I’ve recommended this mousse before and just love it. It’s not too heavy but it’s so decadent. And it’s made in advance so there’s no whipping drama. 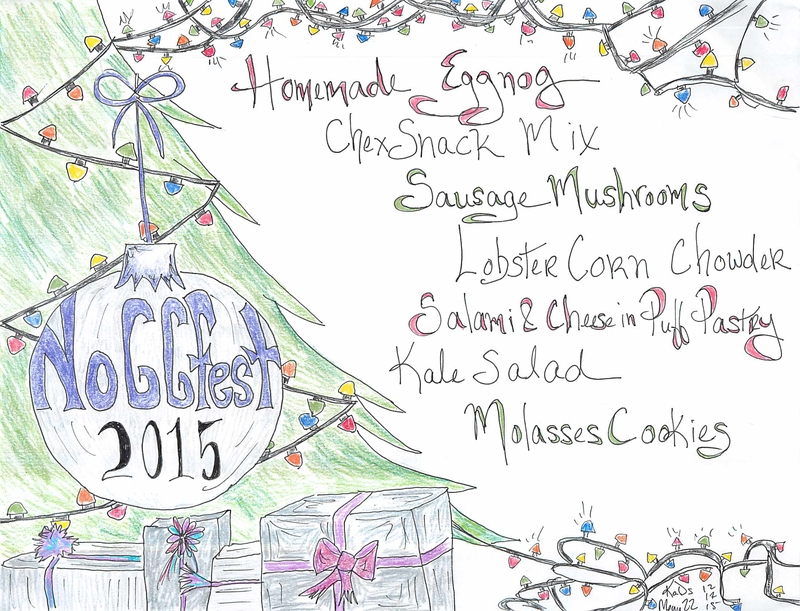 Menu 22 – NOGGFest 2015! Have an open house and call it NoggFest! People love this kind of thing. Friends can stop by this Saturday or Sunday afternoon, grab a snack and a cup of NOG and wish you the merry merry, happy happies that are so this season. It’s all make ahead and easy. Make your own eggnog but stock up on extra boxed (we run out every time). Doctor the boxed with nutmeg and booze. Everybody loves Chex mix. Make a lot. Sausage stuffed mushrooms? Oh yeah. Lobster Chowder…I know it’s spendy but it’s the holidays and it’s a real treat. And it’s delicious (thank you Ina). The puff pastry can be assembled early and left in the fridge until you’re ready to bake it. Everything looks awesome in puff pastry (look at the pic). Kale salad. Well. Don’t you need something green other than your tree? And these cookies – they are the best ever. They smell like Christmas. Add a little ground clove and they are even better (yes, better than Martha’s original version). Throw it all on a table, mix up the nogg, throw open your doors and it’s HAPPY HOLIDAYS! Evenings are hectic. We start with the best of intentions, but then the kids are tired, everyone’s starving, the milk spills. It’s a weeknight. Do not be discouraged. 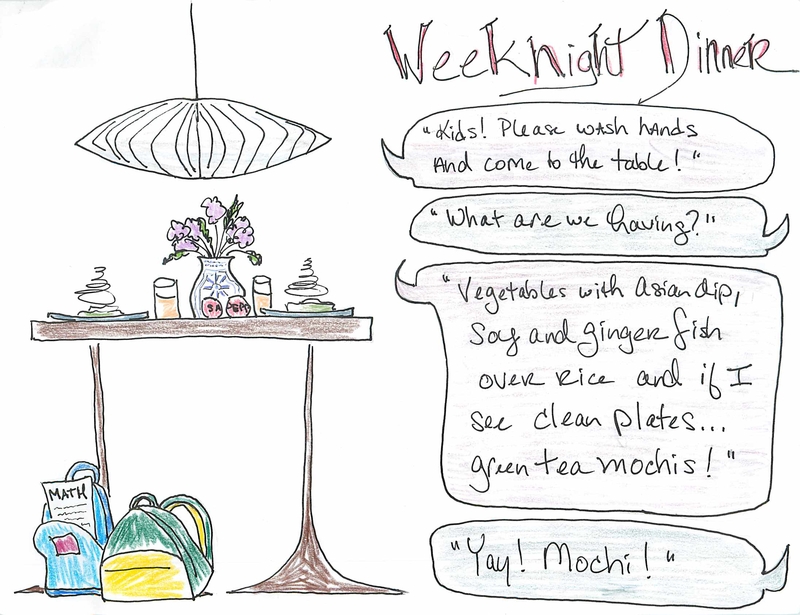 Even with a messy house and tired kids, you are still minutes away from a good tasting, healthy meal on a weeknight. Yes, you are. The answer is not McDonalds. The answer is fish. Don’t assume your kids won’t like it. On this we must remain firm – they won’t like it if it never appears in front of them. We must try. I’ve seen mine eat it and my fully formed opinion is that they want to dislike it more than they actually dislike it. How can I expect them to develop their palates if I cave at their resistance? Besides, I have a secret weapon. Soy sauce. In general, soy sauce conquers all. Tonight, we cook a healthy fish meal that is ready in minutes for tired, hungry, backpack dumping kids (thank you, Melissa Clark). When we get home the first thing the kids do after dumping their backpacks is open the fridge. I will be ready. Raw vegetables and dip…Asian inspired dip which you (yes) made ahead. This is a tactic I regularly employ – a bowl of cold vegetables for them to pick at while I cook. They are starved and it’s a great time to work the vitamin chain. While they eat that, I will quickly steam mild tasting flounder and greens. I usually have rice cooked ahead and tonight is no exception. If you still think this won’t work, offer dessert (it’s not a bribe…it’s an incentive.). A little green tea mochi (they are cute and fun) keeps the Asian theme going and provides a great bribe incentive for kids to clean plates. Give this a try Monday or Tuesday. For the mochi, check your freezer section. A little handheld ice cream fun. Menu 14 – Apples All The Time! So you went apple picking…and now you’re feeling overrun. What on earth are you going to do with 85 apples? It seemed so fun at the time. The web is filled with ideas for apple overflow (pies, sauce, butter). But maybe you want to create a meal, or, surprise surprise, a menu out of your apples! There is a restaurant near us called Applewood that hosts theme dinners where an ingredient is highlighted throughout the meal. That is what I am doing here. Bring on the apples! We start with a cocktail. 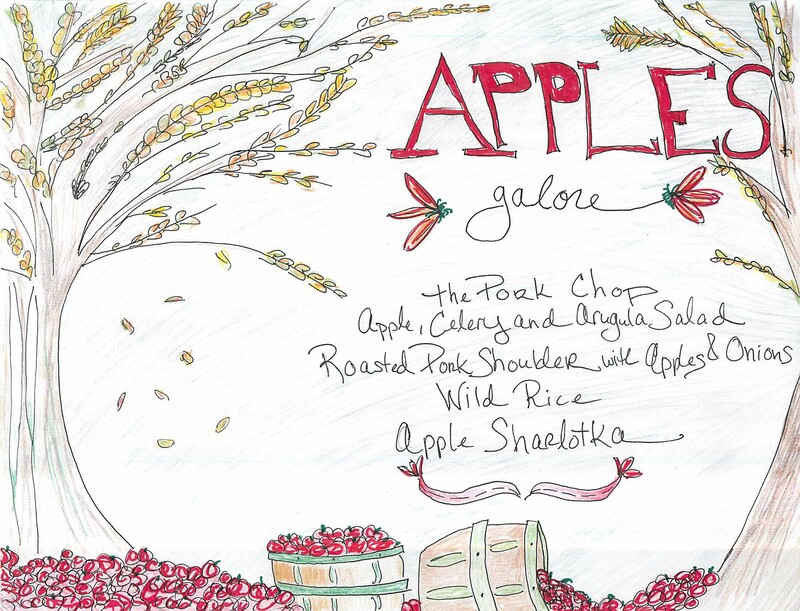 Forget apple martinis – we are going hard cider here with The Pork Chop from Miami’s Yarbird. Next, a big bowl of a crisp salad from Eye Swoon (click, it’s gorgeous – and do not skip the basil, it makes it). Because you called 10 friends to join you, you need a huge pork shoulder like the one from Pioneer Woman roasted with apples and onions, and smartly paired with wild rice (we need more wild rice in life). To finish, you’re taking everyone to Russia with a simple and gorgeous Apple Sharlotka from The Smitten Kitchen. Happy eating! and then, this lovely crisp SALAD…served alongside Pork Shoulder With Apples and Onions and wild rice. Really? You still have apples? Ok. Pickle some (http://food52.com/recipes/16743-quick-pickled-apples) and serve cold the next day with leftover pork. Chop them and mix them with breakfast sausage (more pork!) and freeze. Infuse some vodka and make this cocktail: http://www.whatkatieate.com/recipes/apple-ginger-and-cranberry-vodka-cocktail/. Mix up apple pie filling, freeze it and use in pie, a galette or over pancakes. Still more? Jeez. Drop them in brown paper bags, create a cute drawing and give them to your dinner party friends as parting gifts (look at you the creative host). AND then there’s THIS great idea – use the apples for the table! Look at this gorgeous table design from the super talented Little Green Notebook! I am lucky. I like my mothers-in-law (I have two). One recently came for a visit. She is funny, eccentric, opinionated. She raises her eyebrows a lot. She calls me “darling”. She buys me clothes that actually look good on me. She is, in short, a riot. She also is dying to go back to Paris but has no plans in sight yet. So for her visit, we thought we would do our best to take her there. This menu starts with gougères. They are a home cook’s entertaining secret weapon. They are made ahead, baked from the freezer and wildly impressive. Next, potato leek soup but glammed up with some fried parsley…PURTY. For the main course we go old school but with a modern twist – spiced duck à l’orange. Do not freak out – if you can cook chicken you can cook duck. In fact, everyone should cook duck, it’s delicious. And last but not least, a flashback to 1970s dinner parties with creamy delicious (make ahead) chocolate mousse. Dreamy. For the duck you will need to order a couple of items in advance – the Orange Blossom Water, maybe the Buckwheat Honey and the Ras Al Hanout. Amazon carries each of these things. You may also need to ask your butcher for the duck. Make the effort…your mother in law will appreciate it. 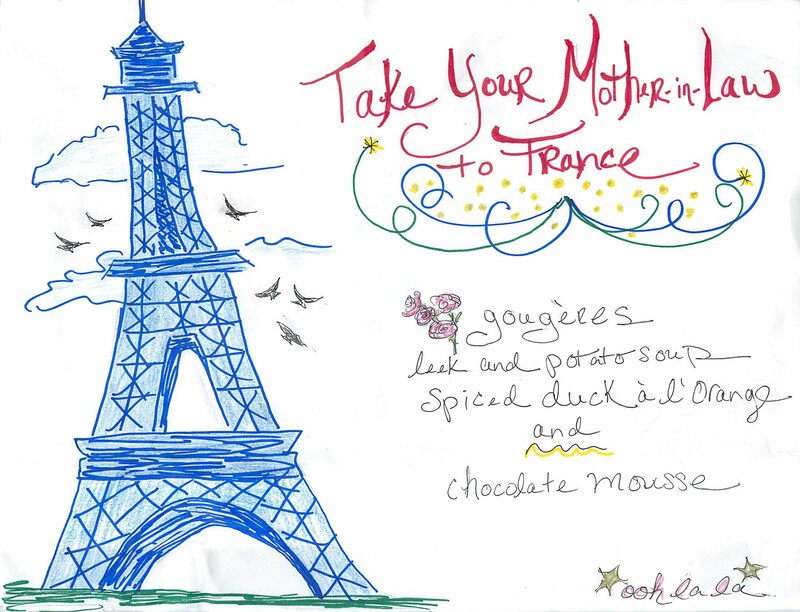 REQUEST: If you make one thing from this menu, I would URGE you to try the gougères. They are the killer app (ha!). Go straight for gruyere…don’t mess with inferior cheddar. I follow the linked recipe exactly, and I mix by hand. There is always a scary moment when you add the eggs and you’re SURE you’ve ruined it – just keep stirring and trust…it will come together. They are hot light steamy cheesy awesomeness. They go straight from your freezer to the oven to a plate where people will swoon and loudly proclaim your greatness. Feel like a hero. Sunday dinner is a THING. Or at least I want it to be a THING. 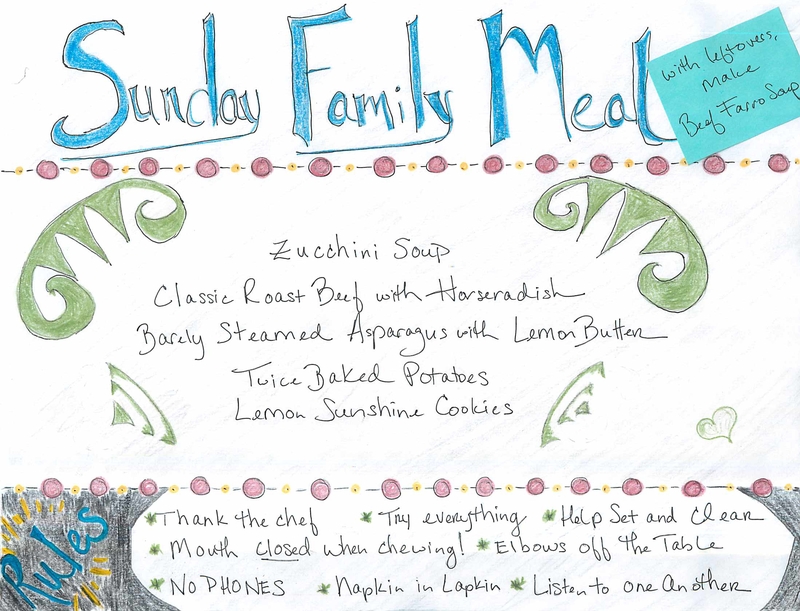 I want my family to know that on Sundays, we have a family meal. Family meals happen other nights too but on Sundays, always. More often than not, we grill a steak or roast a chicken. This week we are planning ahead, keeping it classic and cooking enough for leftovers. And while it may seem extravagant to do a standing rib on an ordinary Sunday, why the heck not? It’s family – let’s make dinner special. Break out the nice china while you’re at it. We are not raising our kids to eat like animals. They need to understand courses. Start with soup. Lucky me, my kids eat almost any soup I put in front of them. Start with zucchini soup (make ahead/easy). I’ve been dying to try this roast beef recipe – it’s a “set it and forget it” kind of thing. I’d serve it with straight up horseradish but if you want to make more of a cream, go for it. Beef is heavy – steamed asparagus is crisp. And of course, potatoes. Your oven will be occupied…this twice-baked version can be made ahead and heated when the beef comes out. And of course a little sweet treat. It’s family, after all. I’ve GOT to try THIS ROAST BEEF RECIPE– legendary. In the comments there is a consensus around leaving it in for only one hour after you turn the heat off. I would do that rather than the two hours in the recipe. Martha, for potatoes. And for those that eat good dinners, COOKIES! And with any leftovers, try this Beef Farro soup.